Lewis Hamilton claimed his 10th pole position of the 2018 Formula 1 season in qualifying for the Brazilian Grand Prix, while nearest challenger Sebastian Vettel faces a stewards investigation. Hamilton went fastest using supersoft Pirellis on the first runs in the Q3 top 10 shootout, setting a time of 1m07.301s. 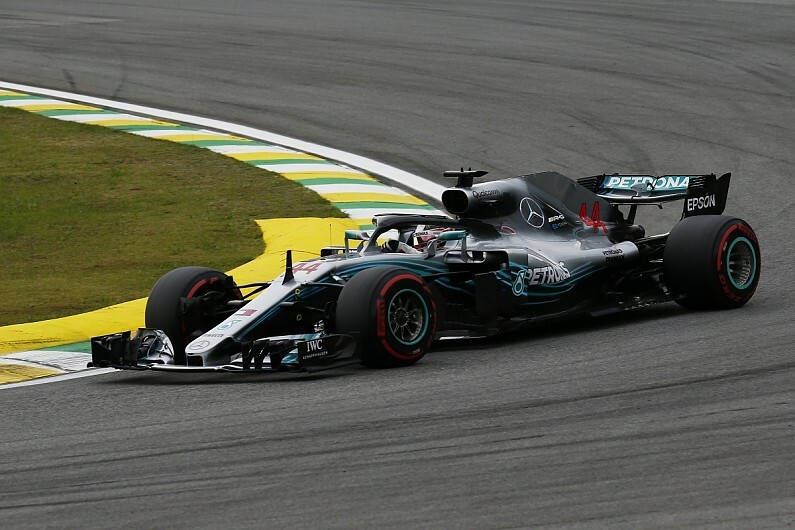 The Mercedes driver was the only one of the frontrunners to improve on his second run, shaving off a further two-hundredths of a second to make sure of pole position. Vettel was up on Hamilton after the first sector on his final run, but a lock up in Turn 8 contributed to him losing time and he had to settle for second based on his earlier lap, 0.093s down. Valtteri Bottas was third fastest in the second Mercedes, pipping Ferrari’s Kimi Raikoknen by 0.015s. As expected, the Red Bull drivers annexed the third row with just 0.002s separating Max Verstappen in fifth and Daniel Ricciardo in sixth. Sauber driver Marcus Ericsson was the only driver other than Hamilton to improve on his second run, ensuring he held onto the seventh place he secured on his first attempt. That put him two-tenths faster than team-mate Charles Leclerc, with Haas driver Romain Grosjean ninth and comfortably ahead of Pierre Gasly. Both Ferrari drivers will start the race on soft Pirellis after aborting their initial Q2 runs on supersofts to change tyres, with the rest of the top 10 qualifiers all locked into using the softest compound. But Vettel was frustrated to be called to the FIA weighbridge early in Q2 when he dived into the pits while in a hurry to change tyres in case of rain. He was reported to the stewards for refusing to turn off his engine, then driving onto the scales and leaving under his own power. Technical delegate Jo Bauer’s report to the stewards pointed out this made it difficult to get a stable weight, and that in driving off Vettel “destroyed the scales”. Haas driver Kevin Magnussen was knocked out at the end of Q2 by a superb lap from Leclerc, who looked set to miss out on a place in the top 10 when rain hit with six minutes remaining. At that point, Magnussen had just pushed Leclerc down to 11th, but the Sauber driver returned to the track after the rain eased and returned the favour. When the rain came, Racing Point Force India driver Esteban Ocon did improve his lap time on a second set of supersoft Pirellis but it was only good enough for 13th behind team-mate Sergio Perez. Renault driver Nico Hulkenberg was 14th fastest after improving his time, but not his position, with a late lap to end up ahead only of the Williams of Sergey Sirotkin. Sirotkin had to swerve and skirt the grass on the approach to the Juncao left-hander while on an outlap after Hamilton attempted to move out of his way by jinking to the left too late. The Williams driver then appeared to express his frustration by attempting a pass on Hamilton into Turn 1 on the following lap. Renault driver Carlos Sainz Jr was the fastest of those eliminated in a frenetic Q1 session, during which spots of rain made it difficult for drivers. Gasly bumped Toro Rosso team-mate Brendon Hartley into the dropzone with a few minutes remaining, putting Ocon into 15th place. But Sainz then posted a lap 0.005s slower than Ocon to take 16th, and slot in 0.011s ahead of Hartley, who complained of a lockup on his best lap that cost him time. McLaren pairing Fernando Alonso and Stoffel Vandoorne were 18th and 20th respectively and separated by 0.199s – as well as the second Williams of Lance Stroll.